Slide-Rail Rear Suspension: Torsion springs combined with suspension blocks create a riding experience that's great for laps around the house, especially if there happens to be a bump or two along the way. AWS™ Front Suspension: Do kids need a smooth suspension? You bet they do. The AWS™ front suspension of the 120 reduces the jarring that bumps can cause, which allows your young rider to keep their machine in better control. 120 4-Stroke Engine: This 120cc engine has enough power to make any kid happy. 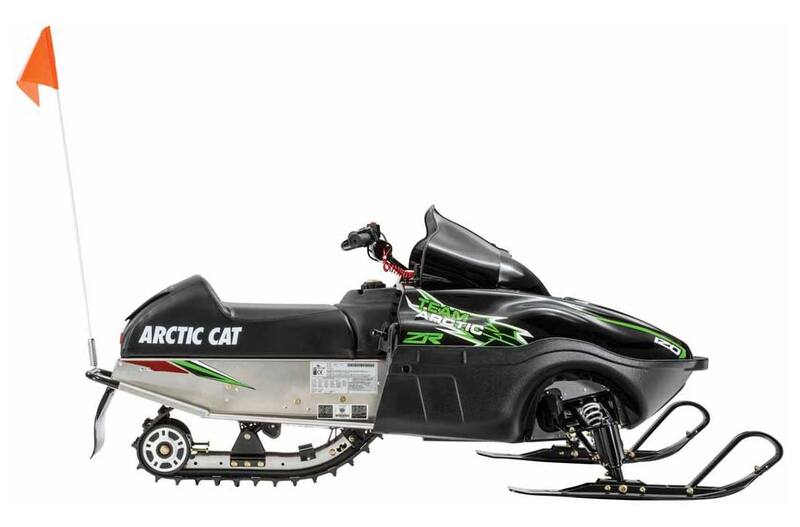 Plus you get 4-stroke reliability that keeps them going until mom says it's time to come in for supper. ZR 120 Chassis: The ZR® chassis has been dominating racetracks and backyards for years. Bringing smiles to kids faces is what this sled does best. Tether Stop Switch: For added safety, the tether switch instantly stops the machine if they ever get separated from the machine while riding. Working Headlight and Taillight: See and be seen with the working headlight and taillight on the ZR® 120. Underseat Storage: Kids like to bring stuff. So it's good to know your miniature rider has plenty of space under the seat to store things they may need. Safety Flag: Little tyke, little machine, big visibility. This safety flag provides your little racer with an added five feet of height visibility for anyone to see where they are. 0.69 in. Track: Grown-ups aren't the only ones who like the steep and deep. With a 0.69-in. lug, your little rider is sure to conquer snowdrifts. Your job is to sit back and enjoy watching them have so much fun.